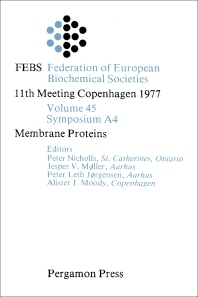 Membrane Proteins contains the proceedings of the 11th Meeting of the Federation of European Biochemical Societies, held in Copenhagen, Denmark in 1977. The meeting provided a forum for discussing progress that has been made in understanding membrane proteins. Topics covered range from hydrogen and electron transfer in mitochondria to energy-transferring systems as well as ATPases and hormone receptors. Comprised of 31 chapters, this volume begins by reporting the results of a study that examined the state of association of several important membrane proteins. The discussion then turns to future prospects for membrane structures; hydrogen and electron transfer in mitochondria; and the molecular mechanism of the respiratory chain proton pump. Subsequent chapters explore energy coupling in reconstituted segments of the respiratory chain; retinal-protein interaction in bacteriorhodopsin; the functional significance of protein-protein interactions in the sarcoplasmic reticulum; and the role of calcium in the action of insulin. This book will be of interest to biochemists.